Regular maintenance of your golf glove keeps it fresh and clean. Although golf gloves go back at least to the late 1800s, they didn't gain traction as a staple item with golfers until the middle of the 20th century. 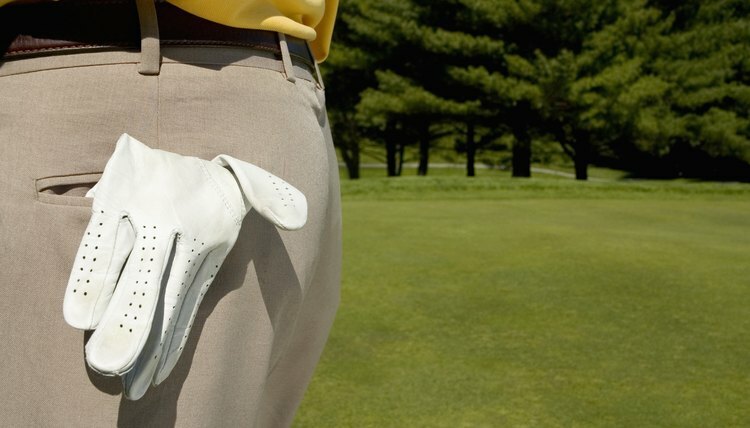 Today, most golfers value the advantage a glove gives them in getting a grip on their games. At an average cost of between $10 and $25, a golf glove is certainly not the most expensive item on a golf course, but poor care results in the need to purchase new gloves on a regular basis, which can add up considerably. Place each of your fingers, but not your thumb, into the fingers of the glove. Press the leather down around each finger, using the fingers of your other hand. Slide your thumb into place in the glove, and gently pull the glove down into place on your hand, smoothing it across your palm and the back of your hand, using your other hand. Fasten the glove into place and bend your gloved fingers to stretch and "seat" it. Tug gently on the glove near the end of each finger and your thumb until the glove is loose on your hand. Grasp the loose fingers of the glove all together and slip it off of your glove hand. Keep your glove as dry as possible at all times. Take an extra glove when you play if you sweat a lot, and rotate them as necessary throughout the game. Allow the unused glove to air dry between uses, straight and flat. Clean your glove using a soft cloth dampened with clean water. Do not overly wet the glove. Lay it out flat to dry, but not in direct sunlight or near a heat source. Put the glove on soon after it dries to stretch it into shape. Hang your glove or lay it out flat and straight when it is not in use. Do not wad a glove up and tuck it inside a golf bag.